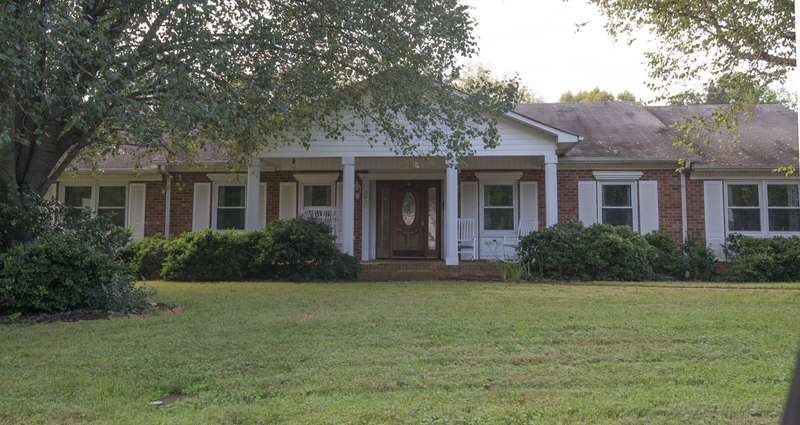 Seven-bays-wide, this symmetrical, side-gabled Ranch house has a brick veneer, brick quoins, and an interior brick chimney. The one-over-one, wood-sash windows have paneled aprons on the façade and the four center windows have molded cornices. The recessed entrance has a replacement door with decorative sidelights and is sheltered by a three-bay-wide, front-gabled porch supported by fluted square columns with vinyl siding in the gable. There is a modillion cornice on the façade and paired windows in the gables. There is a shed-roofed ell at the right rear (southwest) and a breezeway on the right (west) elevation connects to a frame garage. County tax records date the building to 1947. Prior to this house, a two story side-gabled house stood on this lot; it was built in the 1820s and purchased by Nancy Call Cameron; she was widowed in 1826 when her husband William Cameron (brother of Duncan Cameron) died of tuberculosis, leaving her with 7 children to take care of. Her father, Daniel Call, a merchant in Richmond, Virginia, financially assisted her in purchasing Lot 74 and the house upon it from James Clancy. She subsequently purchased Lots 70, 71, 72, and 73 (west to Hassell St.) Per Jean Anderson, she helped support the family by giving music lessons - independently, as well as at Lochiel, and the Burwell School. "The house was completely turned inside out; there was a very handsome supper set up stairs and that night poor Aunt Nancy had not a bedstead to sleep on. The next night Mr. John Kirkland gave them a large party which went off very pleasantly; on Monday night there was adancing party at Mr. William Kirkland's [Ayr Mount]. We staid [sic] all night at Mr. K's and gladly turned our faces homeward next morning. Sister Margaret, Rebecca, Jean, and myself made "Lochiel" our home. Aunt Mary Anderson of course stayed there." In 1851, Nancy Call Cameron deed 70, 71, 72, 73 to her daughter-in-law Emma Moore Cameron and her grandson Allen Jones Cameron, wishing to provide for the family of her son Dr. William Cameron. In the early 20th century, one of William's descendants built the "Elm Cottage," which is remembered as the house of Annie Cameron, daughter of Allen Jones Cameron. Unfortunately, Nancy Call Cameron's house burned in 1964; the Ranch house above was likely built soon after.